A few weeks ago, Hurricane Harvey gushed into the streets of Houston and surrounding areas. It flooded businesses, homes, and schools. But it didn’t stop there. Water leaked from the streets into the manholes and handholes of underground Houston. The FCC reported that 17 emergency call centers and 320 cellular sites went down, and over 148,000 people lost internet, TV, and telephone service. With such an impactful force ona concentrated area, it is easy to see how underground damage can affect millions. Power, broadband, cell and home phone outages led many service providers to begin rethinking the systems used prior to Harvey. Storm damage, trespasser damage, and safety violations happen much more frequently than natural disasters, but they are not nearly as visible as they are when a hurricane strikes; it’s harder to observe immediate consequences in smaller cases of harm. The reality is that the ongoing damage and violation over time in vaults add up, and while the instances may not make headlines, the damage is long-term, destructive, and costly, for asset owners. Underground damage has many causes – unauthorized trespassers, improperly trained contractors, or natural wear-and-tear of materials from the elements. Damage from natural disasters like Harvey are out of the asset owners’ control, but most can be prevented with routine maintainence and inspections. If owners do not know what they had that was damaged, they cannot know what was lost. This lack of knowledge affects the entire business from accounting and finance, to business analysts, engineering and operations. The power of good data is imperative to keeping track of assets. Violations and safety go hand-in-hand, one always affecting the other. Square footage in manholes is small and usually only allows standing room for one person. This small space makes adherring to proper safety guidelines crucial. Improper racking or not racking at all may be performed by a trespassing company, a permitted company, or an ill-trained contractor. Manhole spaces are small. 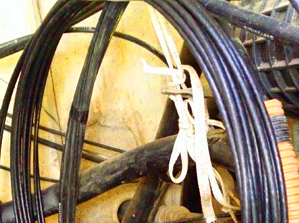 Leaving un-racked cables or excessive coils on the floor (or in inappropriate spaces) causes serious safety hazards for technicians and maintenance crews. Sometimes, instead of breaking into the duct outside the vault, the foreign occupant will place their facilities in the duct and bootleg the route to the residence. This is the most common violation we have found in the western U.S. Unfinished core-drills are a safety hazard for the vault's integrity as well as for workers in the space. Over time, the edges of the hole will deteriorate. The core-drills should be grouted since the cables are not entering through a knockout. Debris from unfinished core-drills create trip hazards and injuries. Such conditions lead to increased liability, like workmans comp claims or even lawsuits from contractor personnel. The owner is responsible for the safety conditions within the real estate space. Competitive access providers are fighting for customer bases, and with rural deployment as a crucial priority on the FCC agenda, it is time now more than ever to get assets organized. Regulatory barriers are being broken and proposals to “propel” deployment are in development. Keeping up with inventory standards that prevent damage, violation, and the loss of revenue or customers is crucial to the future of technology.